French toast is a favorite in my family. I usually prepare this without measuring anything, so in this recipe I’ll be estimating the measurements. But seriously, I don’t think anyone can go wrong with French toast. I use day old French bread, but any kind will do and portion out two slices per person. Heat a skillet or an electric griddle to 325 to 350 degrees Fahrenheit. In a flat bottomed medium bowl put one egg, a quarter cup milk, 1 teaspoon of sugar, one dash each of cinnamon, nutmeg, and salt per person. Whisk these together in the bowl, next place a slice of bread in the wet mixture, and then flip over to moisten each side. 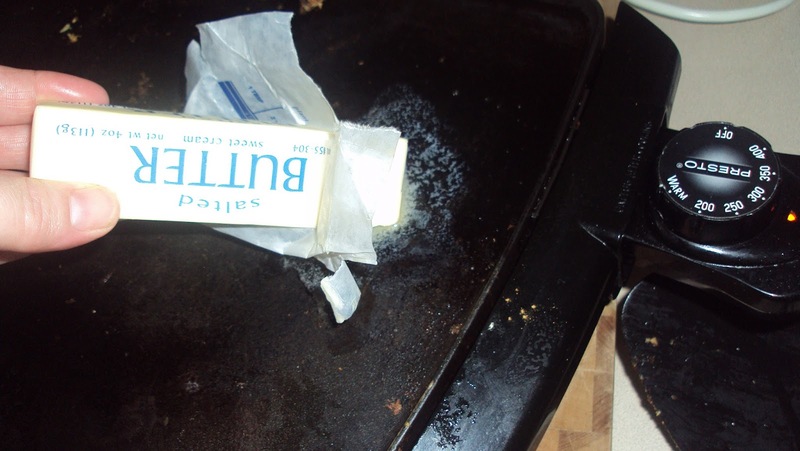 Grease the griddle or skillet by peeling back the wrapper of a stick of butter and rub the small end onto the cooking surface. After buttering, place the moistened bread on the hot griddle. Dunk the remainder of the slices of bread one at a time in the egg mixture, making sure to saturate each side. Begin placing the bread working from the left top corner then across. Once the griddle space is full with slices, let them cook for about 2 minutes, and then begin turning over as each side slightly browns. Any leftover egg mixture can be poured over the toast on the griddle. Turn over the toast in the same order in which they were placed at the beginning. Let them cook for a few minutes more on the other side. Once the French toast looks done, remove the toast from the griddle and put on serving plates. Top with syrup, jam, honey, and butter and don’t forget to sprinkle it with powdered sugar. Yummy!